The critically-acclaimed baseball drama will hit a homer on Blu-ray in January. In an early announcement to retailers, Sony has revealed 'Moneyball' is headed for Blu-ray on January 10. The film tells the story of Oakland A's general manager Billy Beane's (Brad Pitt) successful attempt to put together a baseball club on a budget by employing computer-generated analysis to draft his players. Robin Wright and Jonah Hill co-star. The Blu-ray will feature 1080p video, a DTS-HD Master Audio 5.1 soundtrack, and supplements will include: Billy Beane: Re-Inventing the Game, Drafting The Team, Moneyball: Playing The Game, Adapting Moneyball, and Blooper: "Brad Loses It." 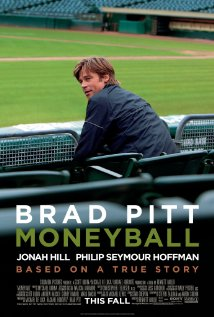 You can find the latest specs for 'Moneyball' linked from our Blu-ray Release Schedule, where it is indexed under January 10.